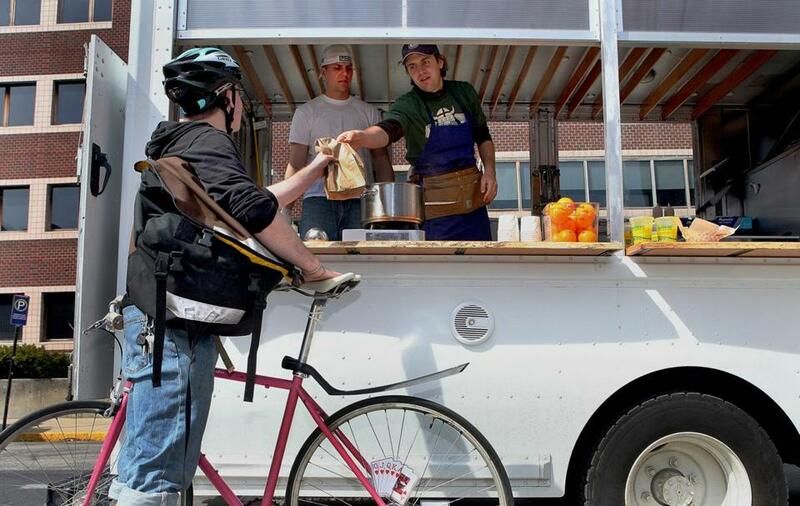 Clover began with a single truck near MIT. At right is owner Ayr Muir. When a city inspector went to the Clover restaurant in East Cambridge last Friday, she found spoiled cauliflower in a refrigerator, hummus and various salads coming back from food trucks at improper temperatures, and the manager not satisfactorily supervising operations at the back of the facility. That inspection was sparked by an outbreak of food poisoning among some of Clover’s customers, which also led the city to shut the restaurant indefinitely, as well as the chain’s Harvard Square location and a food truck in Kendall Square, according to a report provided to the Globe. The chief executive then decided to close the other two restaurants and nine food trucks in the popular Clover Food Lab chain, which all are supplied by the East Cambridge kitchen. Twelve cases of salmonella were reported in June and early this month among patrons of Clover’s various locations in Boston, Cambridge, and Brookline. While the state health department declined to comment, citing its ongoing investigation, Clover CEO Ayr Muir said in an interview that he has received details on half of the people. Those customers had eaten one of two dishes containing pita bread purchased from a supplier, as well as tahini, hummus, and a cucumber tomato salad made by Clover chefs. Muir acknowledged there were food safety practices with which “we could do a lot better,” but added that he thinks food inspectors frequently note violations at many restaurants. “I think we operate some of the cleanest kitchens in the country,” he said. A salmonella outbreak in Mass. has prompted the closure of all Clover restaurants and food trucks with locations in Cambridge, Brookline, Burlington, and Boston. 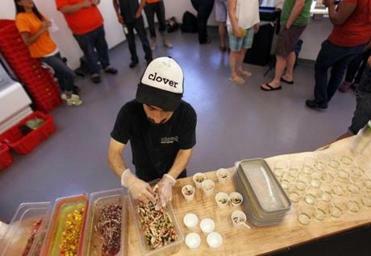 But Clover has racked up a string of safety lapses, ranging from minor violations such as greasy buildup on equipment, walls, and counters to major infractions such as a failure to provide handwashing facilities to employees in a food truck on Park Street off Boston Common. During that same inspection last July, the inspector noted that items such as the cucumber tomato salad, bean salad, and chickpeas were 14 degrees above the chilled temperature necessary for safe food storage. Those same temperature violations were noted again during the Cambridge inspection last week. In March, an inspector cited the East Cambridge restaurant for not keeping cooked eggs at the proper temperature and for not informing customers on its menu that undercooked egg dishes that are served for breakfast pose a higher food-poisoning risk, according to the inspection report. “These are serious violations that get health inspectors pretty agitated. They’re the kinds of things that get people sick,” because they can allow pathogens such as salmonella to multiply, said William Marler, a food safety lawyer in Seattle. While no deaths or hospitalizations have resulted from the current outbreak, one woman told the Globe she became ill with salmonella two weeks ago after eating at the Clover restaurant in Brookline. She ordered an egg and eggplant sandwich — one of the items Muir mentioned as being associated with the outbreak — and said she was treated at a hospital emergency room for severe dehydration, cramps, fever, and diarrhea that lasted for days. Dr. Anita Barry, director of the Boston Public Health Commission’s Infectious Disease Bureau, confirmed that the woman had the infection, and said she is one of two Boston residents with confirmed cases linked to Clover. But the real number of residents sickened could be far higher. “In any outbreak, there are people who don’t seek medical care because they’re not sick enough,” she said, “and some who do seek care might not get a stool culture” to test for a bacteria such as salmonella. The federal Centers for Disease Control and Prevention estimates that 29 salmonella illnesses occur for every case that’s confirmed by a state lab, which would mean hundreds of people in the area became ill from the outbreak. The agency estimates that 42,000 Americans get sick from salmonella every year, and that about 400 die from their infections. The biggest risk factors for outbreaks associated with restaurants involve poor personal hygiene by food handlers, inadequate cooking temperatures, inadequate food-storage temperatures, and cross-contamination of foods by, for example, using the same cutting boards for multiple items. On Clover’s website, Muir, an MIT and Harvard alumnus, promotes his company’s “radically different” way of operating without using preservatives or flavor enhancers, while relying on locally grown, mostly organic ingredients. Those qualities and his transparency in reporting the outbreak on his website appear to have cemented Muir’s bond with his customers, judging by the supportive and forgiving comments on Clover’s website; many promised to keep eating there, while others praised Muir for his honesty. Correction: An earlier version of a headline teasing a related link in this story incorrectly described what’s known about Clover’s connection to the salmonella outbreak. The cause of the salmonella cases remains under investigation.